The fresco depicts a group of Pylian light infantry confronting a warband of mountaineer warriors, possibly Arcadians, that is a Hellenic people of the interior of the Peloponnesus. The Pylian infantrymen are armed with bronze swords of the later short type and spears, and are protected by their characteristic Mycenaean tusk-boar helmets and linen greaves. They wear a linen loincloth covered by leather straps, called pteruges by the Classical Greeks. The battle takes place rather in a border river and in my point of view, that river has to be Alpheios, the river that marked the borderline between the Pylian state – a state extended to most of the western Peloponnesian coastline – and the ‘wild’ hinterland of Arcadia. The lack of armour or shield of the Pylian fighters along with the use of the ‘expensive’ tusk-boar helmets has caused a debate on these incompatible features, but this lack is explained by the need of those light infantrymen for fast movement and rapid action during the military operations. The use of the ‘expensive’ tusk-boar helmet denotes their financial ability (of them or of their king) to be armed with shield and some kind of armour, even a leather cuirass. In general, the earlier depictions of the Mycenaean light infantry come from the palace of Mycenae (16th century BC). The light infantry is depicted in the archaeological findings as frequently as the heavy infantry, which is evidence of its military value. It is worth noting that these two types of infantry are usually depicted together: this is evidence that they operated together, rather supporting one another. Their flexibility of movement and their ability for very close combat (melee combat) made them the identical infantry for operations in semi-mountainous or mountainous terrain, being the most common geophysical terrain of the Hellenic mainland. The sword seems to have been their main weapon, but some of them were also using light spears as it is evidenced in the fresco of the “Battle in the River”. Concerning Pinto’s outstanding representation, I have to note his work on the intensity of the combat and on the depiction of the Peloponnesian hinterland, being actually my homeland. The “Aristonothos vase” (about 700-650 BC) was manufactured by Aristonothos in Magna Graecia, that is the Hellenic colonies in modern South Italy, and was discovered at Caere of Etruria (Caisra in Etruscan, Agylla in Greek and Caere in Latin). It was rather an object of trade between Greek maritime traders and the Caeretan buyers. Its vase-painting of a naval battle provides us with a very good representation of the ships used by the Greek and the Etruscan sea-fighters – being almost identical – and of naval warfare during the Early Archaic period. The ship on the left is probably a triaconter (τριακόντορος) or a penteconter (πεντηκόντορος) while the ship on the right seems to be a merchant ship under attack, protected by heavily armed fighters due to the fear of piracy. 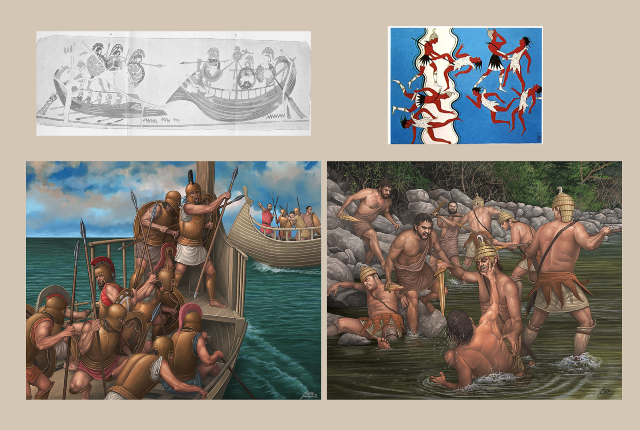 The warriors of the warship on the left, are early hoplites or military ‘ancestors’ of the hoplites, depending on their ethnicity. They wear helmets of the Early Corinthian, Illyrian and ‘Insular’ types, bell-type cuirasses and heavy Argive (hoplite) shields and they are taking cover from the arrows and the javelins thrown to them by the defenders of the merchant ship. They are armed with heavy spears. We can estimate that the scene is taking place in the Tyrrhenian Sea that is the sea covering the area between the Italian mainland and the islands of Corsica, Sardinia and Sicily. This sea area has taken its name by the Etruscan people – called Tyrrhenoi in ancient Greek: Τυρρηνοί – and during the Early Archaic period (700-600 BC) it had been a field of intensive maritime trade, but also a field of frequent and sometimes fierce naval encounters and endemic piracy between Greeks, Etruscans and Phoenicians (including Carthaginians). Actually the ethnic origination did not matter so much for the merchant ships or the warships of a city-state which were at the same time corsair or pirate vessels. The Greeks and the Etruscans used to confront each other, but it was not uncommon for a Greek vessel to attack a ship of another Greek city-state without being in a state of war, or for an Etruscan vessel to attack a ship of another Etruscan city-state. A merchant captain or a commander of a warship was usually a corsair or pirate at the same time without restrictions …if the ship that his vessel was encountering was weakly protected. If the opposing ships were about equal in power (ship construction, armament, manpower and other features), they were usually avoiding confrontation even if their crews were of different ethnic origins and possibly began trading. It was only from the end of the 6th century BC due to the decline of Etruscan power and the limitation of the Carthago-Phoenician sphere of influence in the west of Sardinia, that the Tyrrhenian sea became a safer sea to sail and trade, but even then piracy was not uncommon. The Greeks were not the winners of the naval antagonism in the Tyrrhenian Sea: the Carthaginians were always present in the waters of Sardinia, Corsica and north-west Sicily, the Etruscans were always present along the coastline of Etruria and Liguria, and soon another geopolitical player emerged in the vicinity: Rome.